Location: Idyllwild. 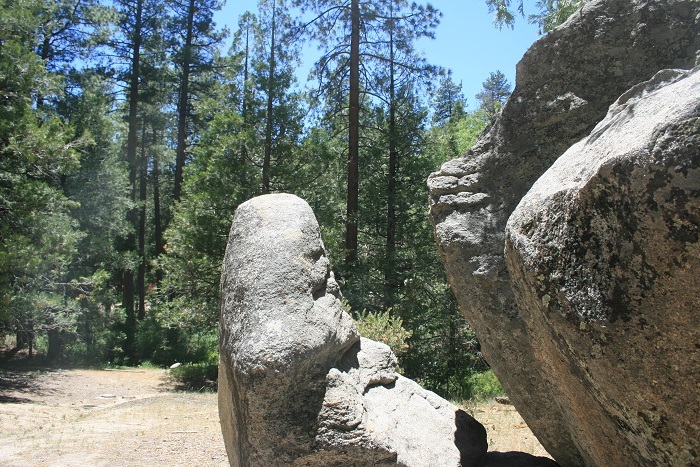 From I-10 in Banning, take Highway 243 south for 24 miles to Idyllwild. Turn right on Maranatha Drive and almost immediately bear left onto Lower Pinecrest Ave. Go 0.3 miles and turn right on Riverside County Playground Road and follow the signs to the park. From Highway 74, take Highway 243 north for 4 miles. Bear left onto Riverside Couty Playground Road and follow it 0.1 miles to the park entrance. Day use fees are $3 per adult, $2 per child and $1 per dog, cash only, change not given. The day use area is just past the entrance kiosk. 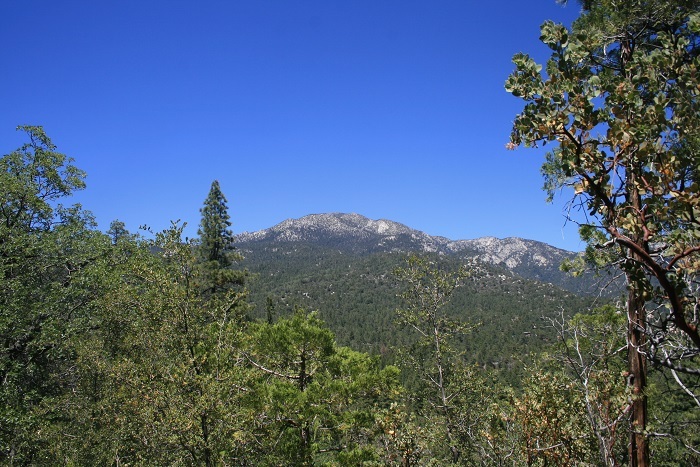 Like the nearby Ernie Maxwell Trail, the trails of Idyllwild County Park offer the scenic perks of the San Jacinto Mountains–majestic pines, black oaks, wide-ranging mountain views–without requiring the commitment to hike to one of the major summits. 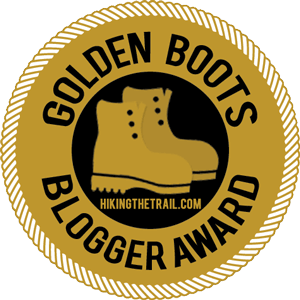 While the Maxwell Trail suffers less from the noise and sights of civilization, this one has more variety, plus an enjoyable and informative nature center. The trails, while well signed, can be a little confusing. The Perimeter Trail, for example, overlaps with several others; at the junctions, the same trail is often signed twice. 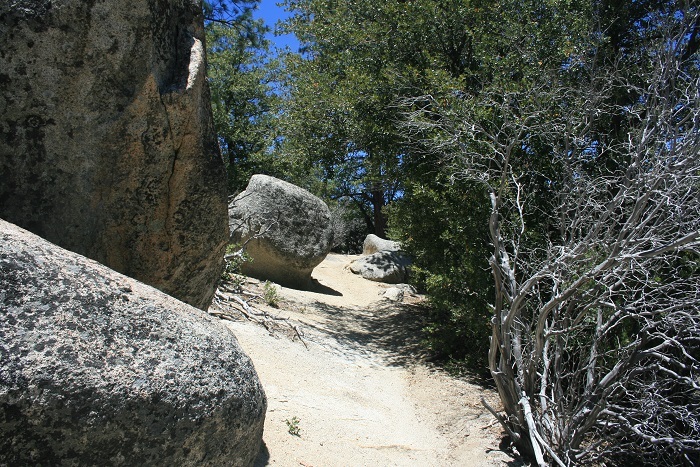 There are a few spots (particularly on the Summit Trail) where the route is a little vague, although if you find yourself having to go off-trail beyond some basic rock scrambling, you’ve likely just lost the trail and should be able to retrace your steps not too far before finding it. The Perimeter Trail, as described here, is a good, moderate route that takes in pretty much all that the park has to offer, but it doesn’t have to be followed exactly. 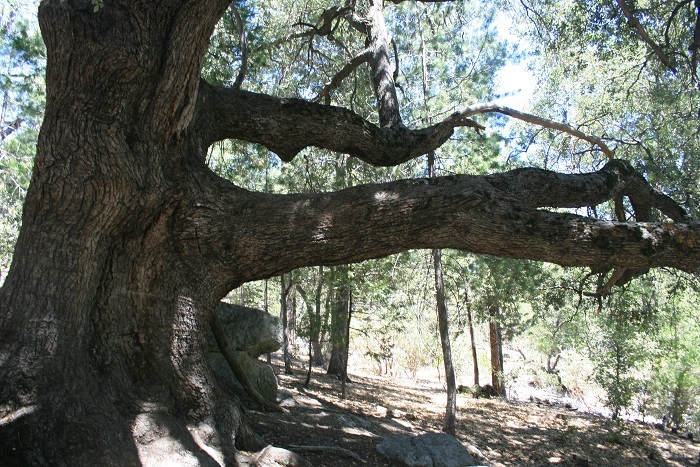 Idyllwild County Park is a nice place to just wander around. 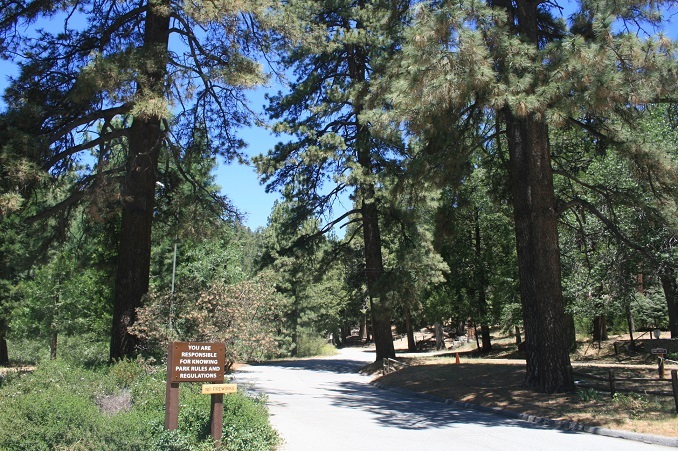 To follow the Perimeter Trail, take the paved road toward the campground. After a few hundred yards, make a hard right on the signed trail and begin walking uphill through an attractive forest of pines and oaks. You will pass several junctions; keep following the signs for the Perimeter Trail. 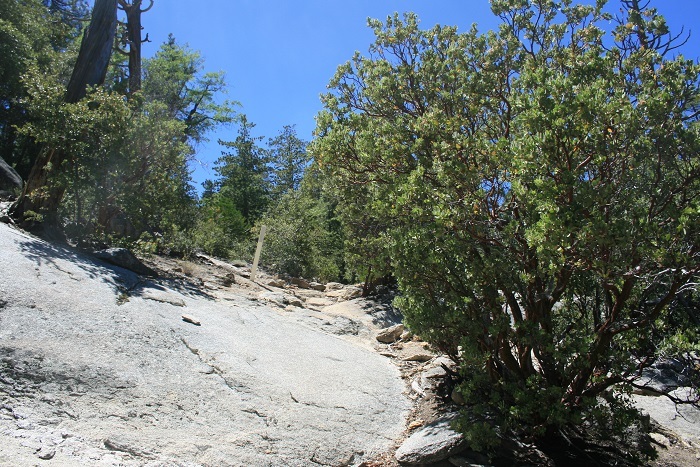 On the right, keep an eye out for views of Tahquitz Rock, Tahquitz Peak and San Jacinto. After 1.1 miles, cross the paved road (an alternate entrance to the park) and pick up the Perimeter Trail on the opposite side. It descends to a T-junction. Both routes lead toward the nature center, but the right trail is more interesting. Take it and then almost immediately turn left. 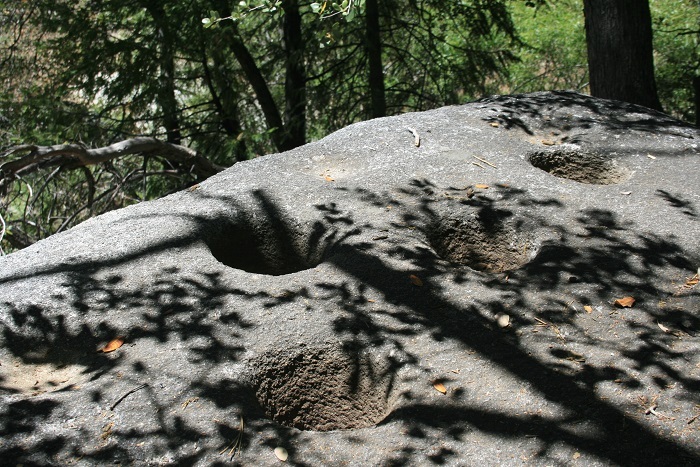 Follow the trail through the woods, passing by a pair of benches overlooking a flat rock with a few morteros. 0:35 – Sticks out like a sore thumb! 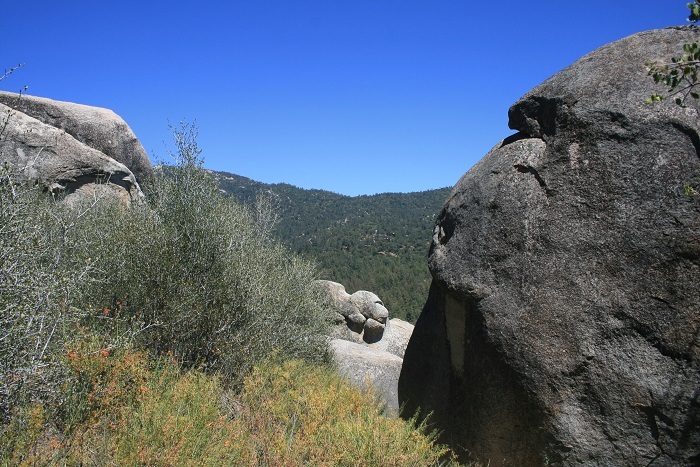 Continuing south on the trail, you pass by a granite boulder with an outcrop resembling a thumb. Just beyond you reach a junction. 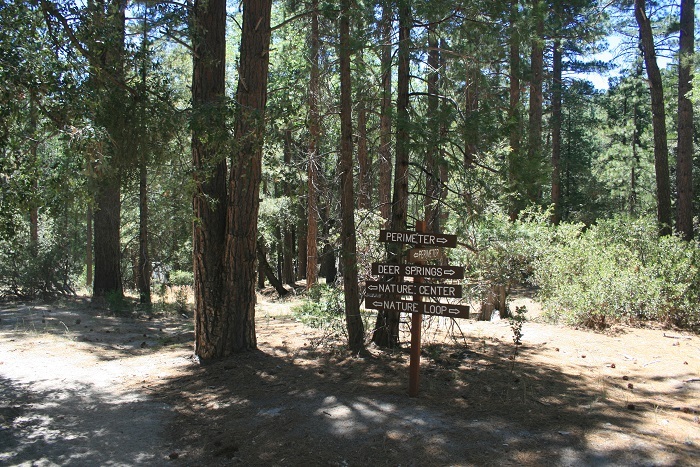 Turn left, briefly leaving the Perimeter Trail and follow the Yellow Pine Trail to the nature center. 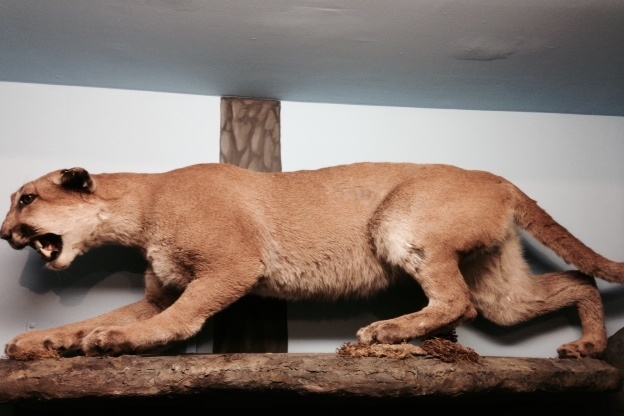 Here, you can take a few minutes to enjoy interpretive exhibits including taxidermy of bobcats, mountain lions, owls and coyotes; Cahuilla artifacts and more. You can also pick up a park map here. At 1.7 miles from the start, you’ll reach the beginning of the Summit Trail, also signed as the Summit Loop. Stay straight and begin a steep climb, making switchbacks up the ridge. Keep an eye out for the white trail markers if you are not sure about the route. After half a mile and about 350 vertical feet, the trail levels out and you get views of San Jacinto and Tahquitz Peak to the left. 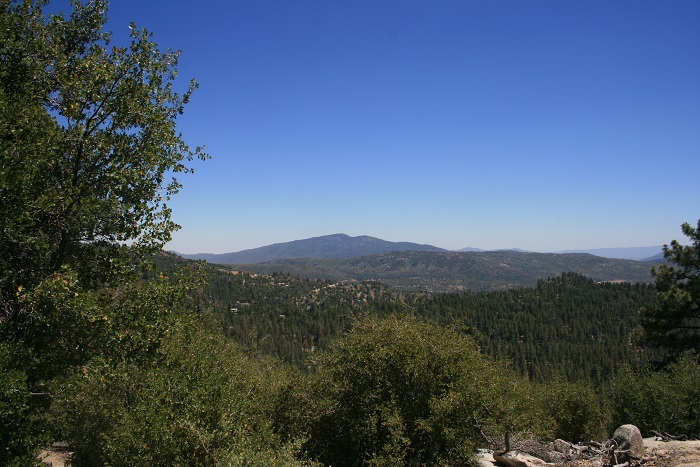 As you follow the ridge south, you can see Garner Valley, Thomas Mountain and the Palomars. If visibility is good, you may even be able to pick out the observatory. 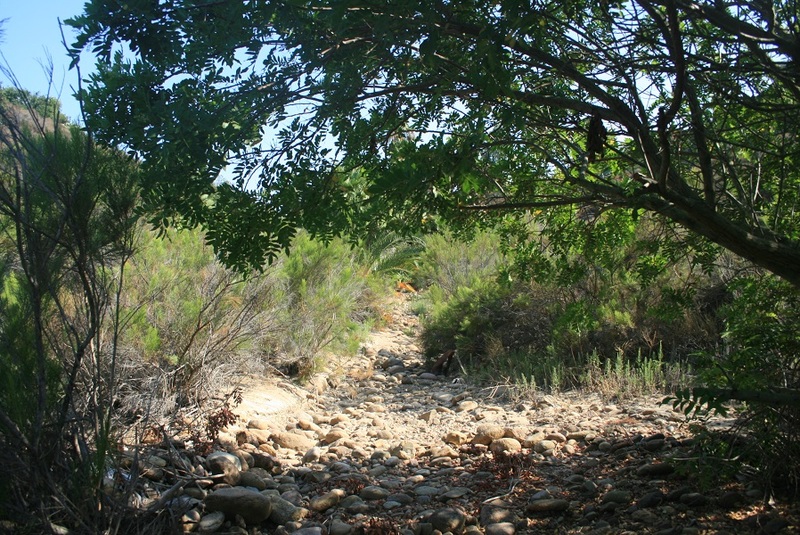 The trail begins a steep descent, at times rocky (be careful; use your hands as well as your feet). 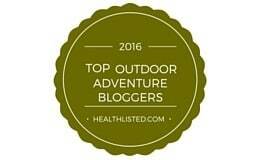 Again the route can be a little tricky but if you look for the white trail markers you should stay on course. The trail drops back into the woods, reaching another junction (2.7 miles.) Stay right and then take a left, following the trail down to the end of Delano Drive. 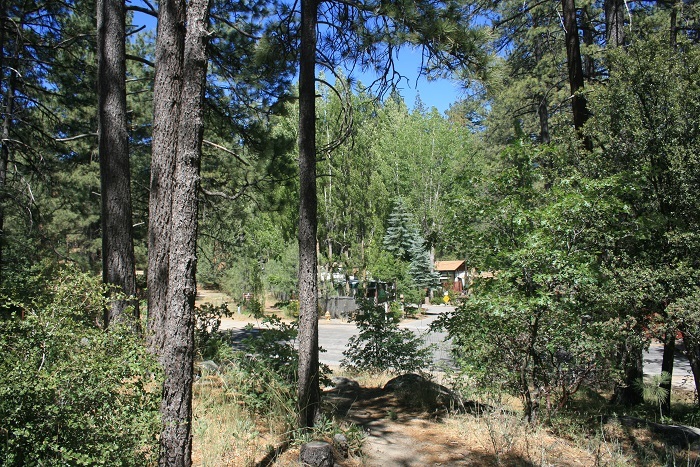 Cross the street and follow the trail back into the park, threading your way between the camp sites on the left and a mobile home park on the right. Ignoring a few false trails that branch off, follow the trail half a mile back to the meadow and the parking area. Hey David thanks so much for the amazing website – I shall be purchasing your book no doubt. We’re from the UK and living in la now for 8months and we have been crying out for some adventure so I think I have found it here. If you don’t mind I would love it if you pointed out some moderate say 5mile max ‘must do’ hikes for our family to do. Our girls are 3&6 years of age. They can certainly march – we have taken them out all their lives. I just wondered if you could help? 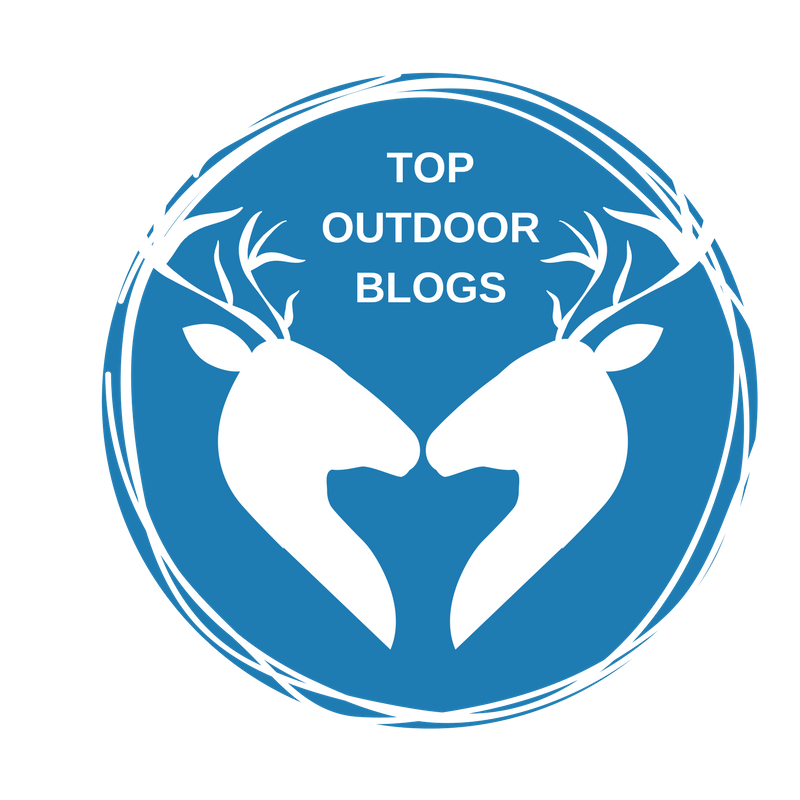 Hi Shaun, thanks for the kind words, glad you are enjoying the site and finding it useful, that’s my goal! Anyhow, the Perimeter trail and the nearby Ernie Maxwell Trail both have some great scenery and are worth visiting. If you don’t mind telling me where you live and how far you want to drive I can make more recommendations for other must-do hikes.